Part 2 of a new series about pedestrian interactions. 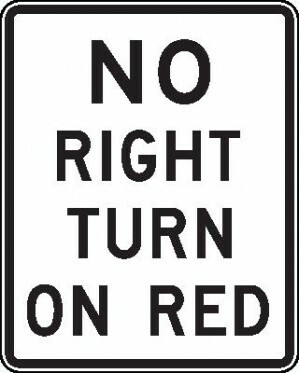 Commuting to work by bicycle for the first time in over a year has reminded me about the practice of allowing right turns on red. A measure intended to improve fuel economy by reducing idling at intersections, its effect on pedestrians and the general attitude on the road is less than stellar. Drivers waiting to turn right in Chicago frequently honk their horns at cars in front of them that are yielding to pedestrians. The risk to pedestrians does not appear to be great, as federal sources reported only 84 fatal crashes during one ten year period . While figures like this seem to indicate that the benefits of right turn on red outweigh the costs, the attitude shown towards crosswalks is still a negative than needs to be addressed in many cities. The stop line is a fairly obvious marking in the road before the crosswalk where cars must come to a halt at an intersection. 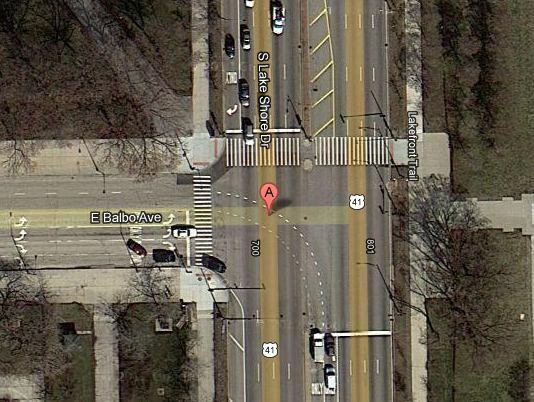 I have seen cars frequently stop in the crosswalk, especially in the Lake Shore Drive/Columbus Drive downtown area. The right turn lane for Roosevelt Road eastbound at Columbus Drive seems to be a magnet for this kind of behavior. A situation frequently occurs where two cars have the standard crosswalk area obstructed, forcing people to walk between cars while inside the crosswalk. One tiny error and someone could be hit and pinned between two cars. In some cases this behavior seems to occur because the stop line is set far back from the corner of the intersection for various reasons. There is also the issue of yielding to pedestrians and the car honking that occurs when people waiting to turn right grow frustrated with the waiting. New York City has a $350 finefor unnecessary honking (honking is only to be used for emergencies, not as a substitute for shouting). Why Chicago has not considered a similar ordinance is quite puzzling. New York City has a reputation for bluntness yet there is also a strong desire for civility judging from the honking ordinance. 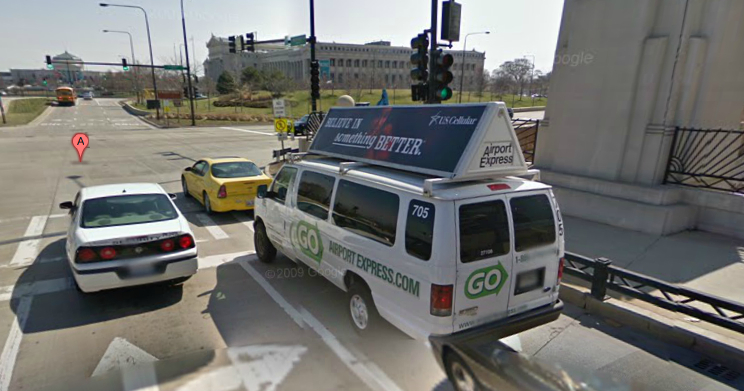 A lot of these issues could be avoided by eliminating the downtown crosswalk issue altogether through the creation of pedestrian underpasses along Lake Shore Drive. 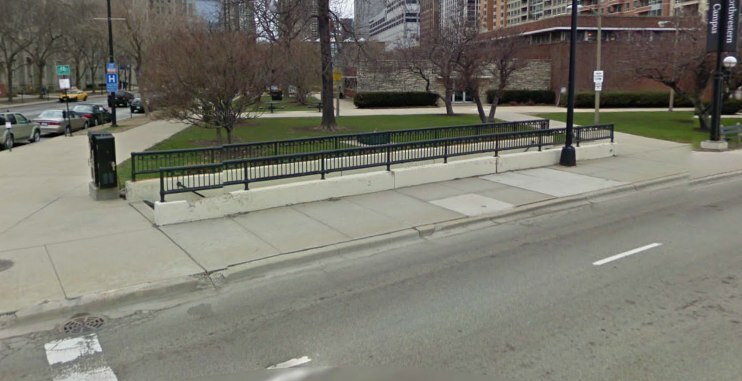 LSD and Columbus Drive have pedestrian underpasses just north of Roosevelt Road, while all other crossings involve pedestrians traversing ten lanes of traffic. In some cities like Las Vegas traffic engineers decided to build bridges for pedestrians. The crossing method of choice in Chicago varies between bridge and tunnel; some pedestrian only crossings like North Avenue Beach-North Side and 35th Street use bridges while Chicago Avenue and North Avenue use tunnels. Pedestrian underpasses would be less obtrusive, but they have obvious safety issues especially at night. Another issue is what happens to the gardens at the corners of Grant Park, since the tunnels would need ramps in addition to stairs. Ramps provide accessible access to the pedestrian tunnel as well as speed up pedestrian flow compared to stairs. The approach to the tunnel would either consume the existing sidewalk forcing it into the park or be situated in the park itself. The solution would be to locate the approaches outside of the park to the north and south. This would avoid having to demolish a part of the distinctively corner gardens. Another solution which would avoid this whole issue would be to eliminate the crosswalks at either end of Grant Park and instead construct a large tunnel running straight between Buckingham Fountain in the center of the block bounded by Balbo and Jackson. This would certainly be more efficient and provide a tunnel that could handle large crowds better compared to multiple small tunnels.